One of South Africa's most consistent forwards, his all-round play made him a regular fixture in the back-row alongside Schalk Burger and Danie Rossouw during the Springboks' march to the 2007 Rugby World Cup crown. His blonde looks and durable physicality have led to many comparisons to another Springbok from Bloemfontein in Andre Venter. 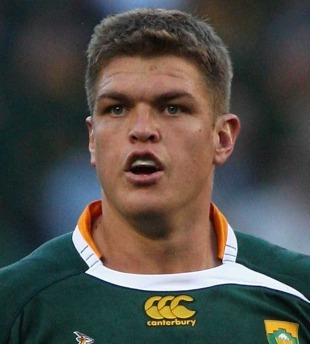 Smith made his debut for South Africa as a replacement in the 29-25 victory over Scotland in Durban in 2003. His first taste of Rugby World Cup action came later in 2003 when he played in four games at a tournament where South Africa lost in the quarter-finals to New Zealand. Smith played only once for South Africa in the 2004 season before regaining his regular position in the 2005 campaign, which also brought success for the Free State Cheetahs as their Currie Cup team secured the title with a narrow win over the Blue Bulls. He captained the Cheetahs in 2006, which was the first year the provincial team had been accepted into the expanded Super 14 tournament. He notched his 50th cap for South Africa when he played in the Tri-Nations match against New Zealand at Newlands in August 2008, a match which was also marked by the 100th appearance of fullback Percy Montgomery. In 2009, he played all three Tests for South Africa against the British & Irish Lions as the Springboks won the series 2-1, before helping them on their way to the Tri-Nations title. A succession of injuries plus the death of his father ruled him out of international action for almost a year, with his return coming against New Zealand in Soweto in August 2010. Injury woe struck again in 2011 with surgery on his Achilles tendon sidelining him for much of the Super Rugby season. He fought back in the hope of playing a part in the Springboks' defence of the World Cup in New Zealand but had to admit defeat in his battle for fitness. An Achilles injury continued to plague him over the next year or so and after four operations failed to resolve the problem he was forced to announce his retirement from the game at the beginning of 2013. But he made a shock return to playing later in the year with French side Toulon who handed him a one-year deal after he passed their medical checks.